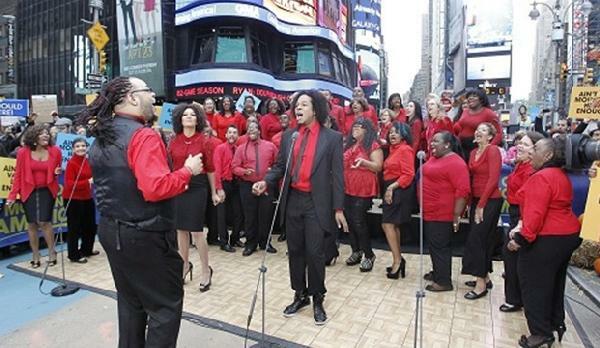 In preparation for Verizon’s How Sweet The Sound National Finale on November 4th at Barclays Center, Newark Regional Winning Choir Power In Praise Mass Choir made a special appearance on ABC’s “Good Morning America.” They were proudly introduced by media mogul Oprah Winfrey who served as GMA’s Guest Host on Thursday, October 25th. Power in Praise Mass Choir, under the direction of Djorέ Nance appeared on “Good Morning America” to sing GMA Anchor Robin Roberts’ favorite song, “Ain’t No Mountain High Enough,” as part of a special tribute show to Roberts as she continues to recover from her bone marrow transplant. Roberts proclaimed ” Power In Praise Mass Choir you got me on my feet, you got me dancing. … It’s all about being uplifted.” Needless to say, the choir wowed the crowd, uplifting and inspiring Roberts, Winfrey and the millions who were tuned in around the world. If you didn’t have a chance to catch Power In Praise Mass Choir yesterday morning on GMA, you can see the incredible footage below. If seeing Power In Praise Mass Choir on ABC’s Good Morning America wasn’t enough, you can join them along with Arkansas’ St. Mark Sanctuary Choir, Atlanta West Pentecostal Church Choir, Pittsburgh’s 4 The Caz of Christ, Michigan’s Apostolic Church Sanctuary Choir, Chicago’s Dexter Walker & Zion Movement and Seattle’s DaNell Daymon & Greater Works Chorale on November 4th at Barclays Center for Verizon’s How Sweet The Sound National Finale. GRAMMY® award-winning artists Donald Lawrence and Yolanda Adams will be hosting the event, with GRAMMY® award-winning artists Mary Mary, CeCe Winans and Hezekiah Walker serving as judges and also performing. There will also be a special “Living Legends” Tribute to The Clark Sisters. For more information on the 2012 Verizon How Sweet The Sound National Finale, log onto www.howsweetthesound.com.